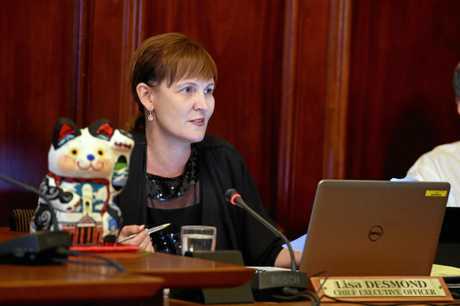 UPDATE: FRASER Coast CEO Lisa Desmond has slammed accusations she and a councillor were involved in an affair. 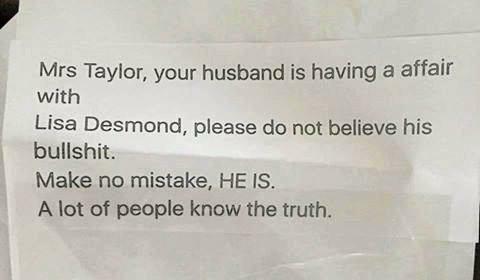 A prepaid envelope from the Botanic Gardens which contained a letter accusing Ms Desmond of an affair with Fraser Coast councillor Stuart Taylor was discovered by Stuart's wife Dana on Thursday morning. "Mrs Taylor, your husband is having a affair (sic)," the letter reads. "Please do not believe his bulls***. Make no mistake, HE IS." Mrs Taylor said her nine-year-old daughter was excited to see a letter, given the majority of correspondence is done via email, but read the letter's three sentences before Mrs Taylor realised the contents. What followed was an explanation as to what an affair is and an attempt to explain to her daughter why someone would stoop so low. Ms Desmond slammed the accusation. "It's a shameful act, a vicious lie to cause our families hurt," she said. "Our families do not deserve this type of personal attacks." It is the second high-profile accusation to involve Ms Desmond, after she and former mayor Gerard O'Connell were targeted in a similar smear campaign last year. "Personally it is upsetting to again have to respond to nasty, spiteful rumours of another affair," she said. EARLIER: FRASER Coast councillor Stuart Taylor and his wife Dana were forced to explain the meaning of "affair" to their young children after receiving a vicious letter on Thursday morning. 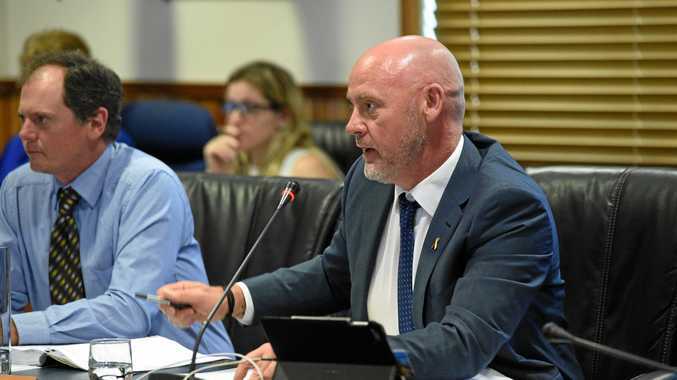 A prepaid envelope from the Botanic Gardens contained a letter which accused the Fraser Coast councillor of an affair with Fraser Coast Council CEO Lisa Desmond. "People don't realise how far-reaching their actions may be," Mrs Taylor told the Chronicle. "I don't understand people like that. Have you got nothing better to do with your time?" The Taylors decided to confront the issue head-on. Mrs Taylor suggested the person responsible for the letter "hire a better private investigator or upskill" themselves, while Cr Taylor described the sender as a "maggot". "I'm not shying away from the fact some scumbag is attacking my family," Cr Taylor said. "This isn't just an attack on Dana or myself, it's an attack on a CEO that is doing an incredible job for this community. She's serving this community and doesn't have to be treated in such a derogatory way. "It was an absolute lie then, and it's an absolute lie now." "She (Ms Desmond) has got a loving relationship with an incredible man, he's a lovely bloke and we both know him well. For him and Lisa to be treated this way is completely unfair," Cr Taylor said. "The person responsible for this should feel absolute shame for what they've done."